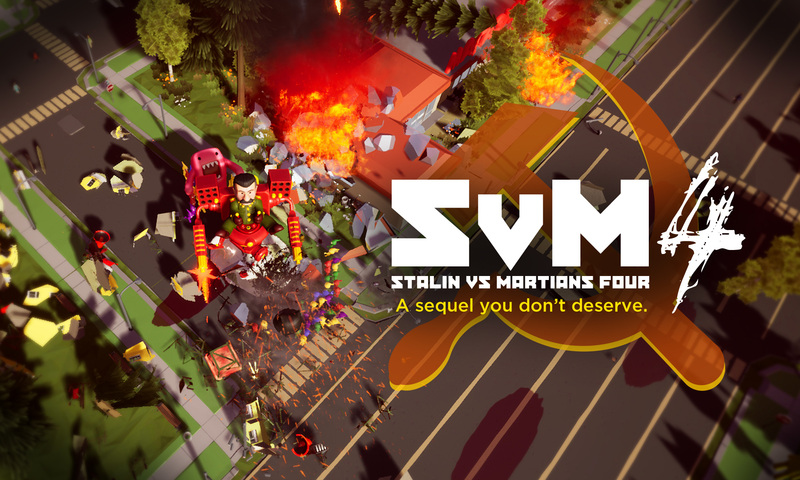 Stalin vs Martians 4 is a rather unexpected sequel to 2009’s infamous real-time strategy game. GameSpot named the original Stalin vs Martians ‘perhaps the worst RTS game ever created’. That’s high praise. You don’t hear it every day. We feel that the most appropriate way of celebrating the 10th anniversary of SvM’s release is to unleash a new installment of this successful franchise. And it is no longer a RTS game. We need to conquer other genres as well. Stalin vs Martians 4 is an isometric action/shooter game. Which is frankly quite obvious from the screenshots provided. There is a certain emphasis on total destruction of everything, so the game feels a little bit like Katamari Damacy, but in reverse. It is also a narrative-based game that will teach you something. Some people were born for greatness, we were born to develop Stalin vs Martians games. Okay, that came out wrong. Keep scrolling down. Stalin vs Martians 4 is produced by KREMLINCORP Entertainment GmbH, an international business conglomerate which absorbed a previous developer Dreamlore. It also absorbed some other stuff along the way. Including your mom. If you require some physical interaction, KREMLINCORP is headquartered somewhere around Kremlin, so you can just ring the bell there and ask for directions.